05-09-2018 • Categories: New release, Search! We have released a new version of Search!, Textkernel’s powerful semantic searching tool, with an update for the reporting functionality. 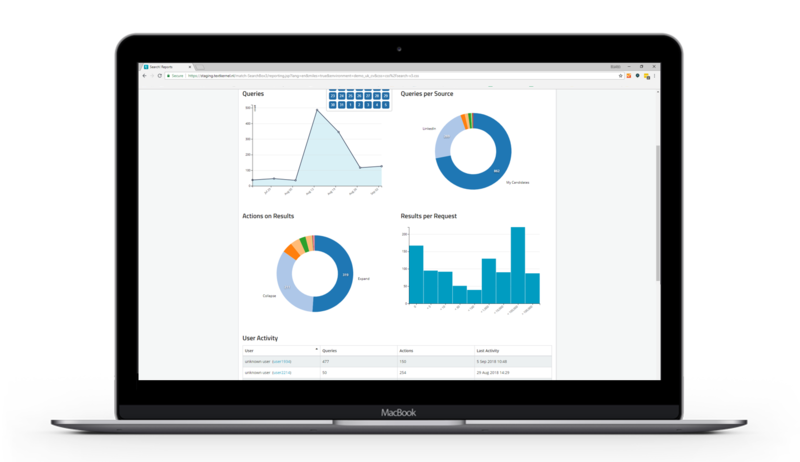 The new User Activity Reporting allows you to dive deeper into user adoption on an individual level, helping you provide even better guidance to your team. Search! User Activity Reporting. What’s new? Gain insight into most used keywords, fields, etc. Customers with access to the reporting functionality in Search! can now filter on individual users over a specific date range to get valuable insights into user adoption of Textkernel’s powerful semantic search tool. This also helps monitoring roll-out of strategic plans in the daily workplace. The new User Activity Reporting includes statistics such as the number of queries ran by individual team members, and the number of searches they’ve saved. Furthermore, users can now see which actions were performed on the search results, such as viewing a candidate profile, tagging a candidate or matching a job to candidates. 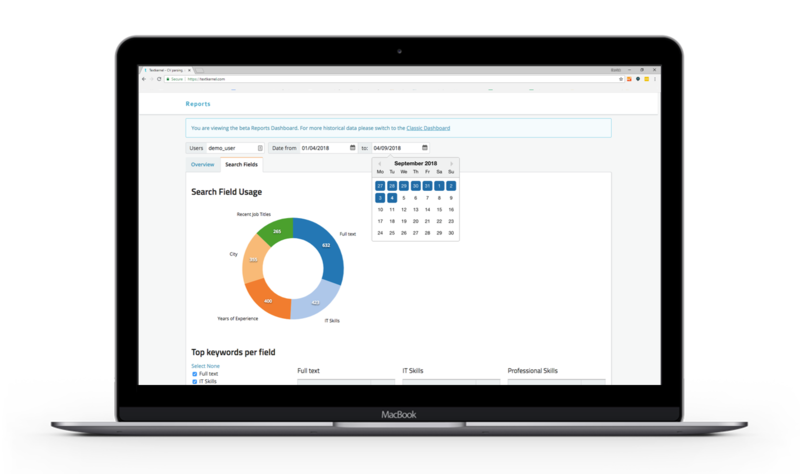 The most-used search fields and keywords are also shown. These new insights provide reporting functionality users with a very clear and measurable understanding of user adoption. This will help them determine if for example more training is required or if there are heavy-users within the team that can be made ambassadors to help drive further adoption. These insights will help managers and team leads guide their team(s) more effectively. Insights provided by User Activity Reporting in Search! also help monitor the progress of strategic plans within the workplace. This can highlight whether everything is on track or further guidance is needed to make sure the entire team is moving in the same direction. Furthermore, insights into search queries, most used keywords and fields, actions performed by the team members – and their success rate, can help refine strategy for the near future. Interested in reporting that is more advanced than the standard dashboard offering? It’s also possible to fetch the raw activity events via the User Activity Export API, then supply them into your business intelligence tool to create your own aggregations and reports. User Activity Reporting is now available for all Search! users with access to the reporting functionality! To access the new feature, go to the regular reports in Search! and follow the link to the beta dashboard at the top of your screen. Search! is Textkernel’s powerful semantic search and sourcing tool, that helps you uncover hidden talent in your own database or in external sources. Not a user of Search! or the reporting functionality in Search! yet? Contact us, we’re happy to discuss the options.